This article is about identification of people. For the wildlife study technique, see Wildlife photo-identification. Photo identification may be used for face-to-face authentication of identity of a party who either is personally unknown to the person in authority or because that person does not have access to a file, a directory, a registry or an information service that contains or that can render a photograph of somebody on account of that person's name and other personal information. Some countries – including almost all developed nations – use a single, government-issued type of card as a proof of age or citizenship. The United States, United Kingdom, Australia, New Zealand, and Ireland do not have such a single type of card. Photo identification cards appear to have been first used at the 1876 Centennial Exposition in Philadelphia, Pennsylvania. The Scottish-born Canadian photographer William Notman, through his affiliated business, Centennial Photographic Co., which had exclusive photographic concession at the exhibition, introduced a photo identification system that was required for all exhibitors and employees of the exhibition. The innovation was known as a "photographic ticket". 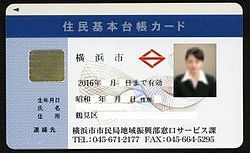 ^ "Basic Resident Registration Card". Ministry of Internal Affairs and Communications. Retrieved 10 Dec 2014. ^ Hall, Roger, Gordon Dodds, Stanley Triggs (1993). The World of William Notman. David R. Godine. p. 46, 47. Retrieved 31 December 2015.